With the 2012 spring chinook salmon run expected to number 314,200 adults entering the Columbia River, and sea lion take expected to be only about two-thirds of 1 percent of those fish, "there is no pressing need to continue to kill federally protected wildlife in the next few weeks, and before this case can be heard on the merits," according to a brief filed April 27 in U.S. District Court in Portland. "Therefore, in order to prevent the irreparable harm to Plaintiffs that will occur if the sea lions Plaintiffs and their members regularly see, enjoy watching, and photographing, are killed simply for eating fish, Plaintiffs ask that the Court issue the requested preliminary injunction," the HSUS filing says. The organization on April 6 asked the court halt an ongoing Oregon-Washington state effort to trap and remove California sea lions that are preying on salmon below the Columbia's Bonneville Dam. The states received permission March 15 from NOAA Fisheries Service under the Marine Mammal Protection Act's Section 120 to remove California sea lions that are having a "significant negative impact on the decline or recovery of salmonid fishery stocks." The federal government and Northwest states and tribes April 20 urged the court to deny the injunction request. The April 27 HSUS reply again stressed the need to stop the removal program until the lawsuit they filed March 19 can be fully vetted. The letter of authority issued by NOAA Fisheries said as many as 92 California sea lions could be removed annually for the next five years without causing harm to what has been a growing sea lion population. So far this year nine have been trapped and euthanized and an 10th California sea lion was shipped off to Shedd Aquarium in Chicago. Oral argument on plaintiff's motion for preliminary injunction are scheduled for May 15 in Portland's U.S. District Court before Judge Michael H. Simon. The April 20 federal memorandum says NOAA Fisheries has during the development of its decision answered questions raised by a federal appellate court regarding a prior lethal removal decision. The U.S. Court of Appeals for the Ninth Circuit overturned a NOAA Fisheries authorization issued to the states in March 2008. The new authorization was issued with the declaration that the appeals courts concerns had been addressed. "After an extensive administrative process and through repeated consultation with a statutorily created Pinniped-Fishery Interaction Task Force ("Task Force"), NMFS has determined that pinniped predation at Bonneville dam poses a serious risk to ESA-listed salmonids; that is, sea lions at Bonneville dam are having a 'significant negative impact'," on the decline or recovery of these listed salmonids, the federal brief said, noting Section 120 language. "In this exact circumstance, Congress has spoken directly to this issue and clearly instructed NMFS to favor ESA-listed salmon and steelhead over a healthy population of sea lions," the federal brief said. 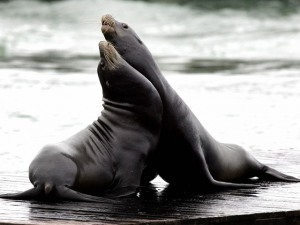 The HSUS brief says the federal government has failed to provide a "cogent" explanation of how sea lion predation on salmon in the Columbia is "significant." "Specifically, the Ninth Circuit found that NMFS had failed to adequately explain its finding that sea lions were having a significant negative impact on the decline or recovery of listed salmonids in light of earlier findings by NMFS that fisheries that cause similar or greater mortality to the same populations are not having a significant negative impact," the HSUS filing says. The brief stressed that much higher tolls are taken by NMFS-approved harvests. "NMFS has failed to do so again here. In fact, Federal Defendants brazenly state that Section 120 does not require NMFS to 'reconcile any lethal removal authorization with other, unrelated sources of mortality affecting ESA-listed salmonids.'" "Federal Defendants' cannot ignore the directives of a federal appeals court simply because they do not like the outcome." "Because NMFS's prior Section 120 authorizations were previously rejected by the Ninth Circuit on this basis, it invariably follows that the public interest lies in favor of preserving the status quo at this time," the HSUS brief says. "Indeed, the public interest is plainly served if NMFS is precluded from going ahead with its decision, the entire purposes of which is to allow the irreversible killing of federally protected sea lions."